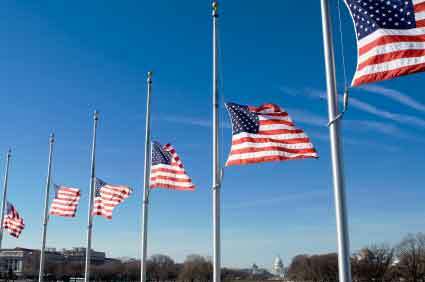 American Flags are to fly at half-staff Thursday, February 15th through Monday, February 19th in honor of the victims of the Parkland, FL school shooting. 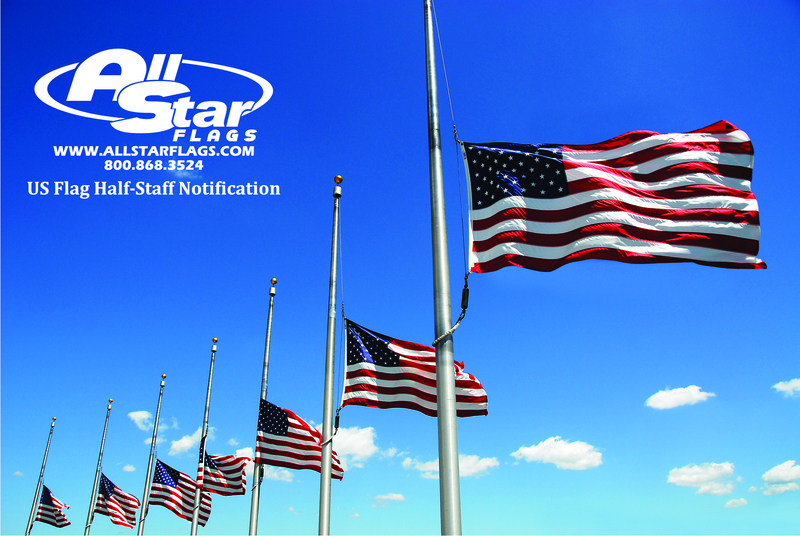 American Flags to fly at half-staff Sunday, December 7th throughout the United States in honor of 2014 National Pearl Harbor Remembrance Day. We honor the lives of those that battled and perished in the dreadful attack on Pearl Harbor. Americans to observe this solemn day of remembrance and to honor our military, past and present, with appropriate ceremonies and activities.I urge all Federal agencies and interested organizations, groups, and individuals to fly the flag of the United States at half-staff this December 7 in honor of those American patriots who died as a result of their service at Pearl Harbor. American Flags to fly at half-staff Sunday, October 12th in honor of the National Fallen Firefighters Memorial Service. American Flags and Virginia Flags to fly at half-staff Friday, August 1st at the Capitol in honor of former US Representative Caldwell Butler. Flags are also to be flown at half-staff in the City of Roanoke and in any location deemed appropriate. American Flags and Kentucky Flags to fly at half-staff Tuesday, July 29th in the Commonwealth of Kentucky in honor of US Marine Pfc. Randolph Allen. Pfc. Allen served during WWII and had been classified as KIA November 1943. His remains were recently positively identified. Pfc. Allen served with Company F, 2nd Battalion, 2nd Marine Division. American Flags and Massachusetts Flags to fly at half-staff Monday, July 28th in the Commonwealth of Massachusetts in honor of Army National Guard Sergeant Major Kevin Walsh. Sergeant Major Walsh entered the service in 1978 and served until the time of his death. He was most recently assigned as a Plans and Operations Non-Commissioned Officer in the Joint Operations Center at the Massachusetts National Guard Joint Force Headquarters, Hanscom AFB. His awards include: the Defense Meritorious Service Medal(1), Army Commendation Medal(2), Army Achievement Medal(4), Army Good Conduct Medal(5), Army Reserve Components Achievement Medal(7), National Defense Service Medal(2), Armed Forces Service Medal(1), NATO Medal(1), NCO Professional Development Ribbon(3), Army Service Ribbon(1), Overseas Service Ribbon(2), Driver/Mechanic Badge(1), Armed Forces Reserve Medal with M Device(1), Kosovo Campaign Medal(1), Global War on Terrorism Service Medal (1) and American Campaign Medal(1). North Carolina Flags to fly at half-staff Sunday, July 27 in honor of Korean War Veterans Armistice Day. It is estimated that 149,000+ NC Citizens served in Korea. 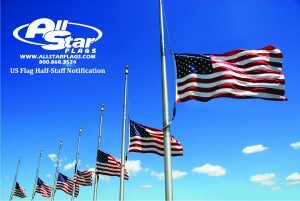 American Flags and Kentucky Flags to fly at half-staff Thursday, July 24th in the Commonwealth of Kentucky in honor of USAF Staff Sgt. Dirk Shelton. Staff Sgt. Shelton died as a result of injuries suffered on a training mission. He served nine years for the US Air Force and was deployed six time; four to Afghanistan, one to Somalia and one to Kuwait. His awards include: the Bronze Star, the Joint Service Achievement Medal (2nd OLC), and the Air Force Achievement Medal. American Flags and Michigan Flags to fly at half-staff Friday, July 18th through Sunday, July 20th in honor of former Lt. Gov. Connie Binsfeld. Binsfeld served as Lt. Governor of Michigan from 1991-1999. She had previously served in the State House of Representatives for four terms and spent two terms in the State Senate.